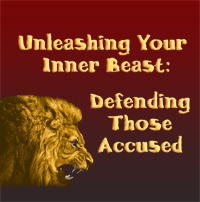 This series is all about Unleashing Your Inner Beast and honorably defending your client while attacking your opponent at trial. Today, our courthouses are filled with the falsely accused, the over-charged, and the mercilessly punished. The Beast Series is about tenaciously fighting, while being fully prepared and primed to successfully attack and defeat the heavily-armed accuser. You will receive an abundance of tools and insight from the excellent presenters, so we can fight with a fury that will not be forgotten.